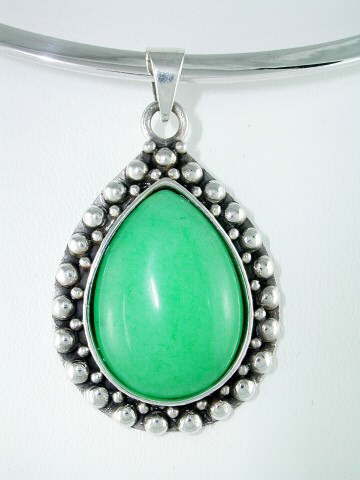 Super green Jade pendant set in a pretty 925 sterling silver mount. The Jade is from China. In ancient times in Imperial China, the Chinese believed that Jade had all the attributes most valued by their society; those of strength, purity and beauty. Jade became a byword for something special, in much the same way we might say something is 'golden' or gold dust'. Jade is said to radiate unconditional love and forms a connection with the Divine at our heart centre, helping balance emotions. The green type is most favoured for this as it is one of the heart colours. Wearing a piece is said to guard against illness and holding (or wearing) a piece of Jade is also said to improve judgment. Ancient traders often held a piece when bartering to improve their chances of securing a good deal, not so much through attracting money, but more through attaining clarity of mind via balanced emotions, which aided the decision making process. This also makes Jade a good stone to use in business or to have in your work environment. With a cool, smooth, waxy appearence, Jade feels soft to the touch, but is in fact incredibly hard. Some of the most prized Jade came from Burma, but it is now more readily available from China. It can be found in various colours and shades including green, yellow, white, cream, grey and rarest of all, lavender. These colours form over millions of years from different minerals in the rock. The emerald green colour is called Jadeite or Imperial Jade and gets its colour from the inclusion of chromium. Other colours include iron inclusions (green and brown) and manganese which is thought to produce the violet/lavender colors.